We loved Louise's general appearance the moment we laids eyes on her ! She has a strong and level topline, very angular and plently of width and height in the escutcheon. She was Grand Champion Jr Nubian (43 juniors!) 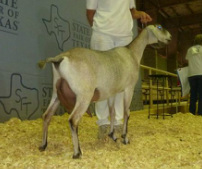 and BEST JUNIOR DOE IN SHOW at the 2010 Fort Worth Stock Show. This was especially satisfying as she bears our herd name and she was one of our first daughters out of our buck Lightning...and then she freshened..SIGH!! She has a very well attached and functional udder but has very different teat placement from her sister Thelma (interesting & frustrating thing about genetics !!) We are hoping to capitalize on her outstanding general appearance by using 'udder' bucks who will improve her udder but not detract from her good 'looks' ! We've retained her doeling from Toy Story (Calysta) in 2012 who in 2016 became SGCH and LA'd 91 ! She was bred for that last time (because of her advancing age) to Honor and gave us a beautiful Serafina, a doeling that looks just like her. She will continue as a valuable contributor on our milk line as long as she wants/is able to and then will retire with our other "Golden Oldies".